Sylwia Lorenc started playing the flute at the age of eight at the Primary Music School and then continued her musical education at the High Music School in Rzeszów. She graduated from the Fryderyk Chopin Music Academy in Warsaw where she studied flute with Prof. Elżbieta Dastych-Szwarc. During her studies she participated in many International Master Classes led by the prominent flute players and teachers such as James Baker, Jean-Pierre Rampal, Grzegorz Olkiewicz and others. She performed and cooperated with the Polish philharmonic orchestras, such as the Rzeszów Philharmonic Orchestra, the Warsaw Philharmonic Orchestra conducted by Marcin Nałęcz-Niesiołowski and Jerzy Maksymiuk and the Orchestra of Humour led by Waldemar Malicki. In 2003 she was on a concert tour in Quatar and Turkey. At present she gives many concerts and performances. 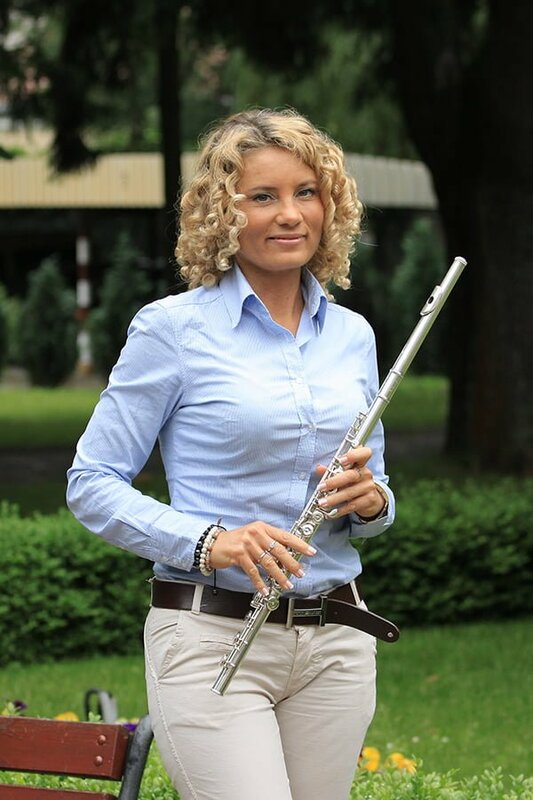 She is the first flutist and soloist of the Stanisław Moniuszko Polish Army Concert Orchestra of Representative Artistic Ensemble of The Polish Armed Forces (RZAWP) and the member of the classical wind quintet “Favori”. With these ensembles she gives many concerts and performances in Poland and abroad, among others in Japan, Belgium, Holland, Germany and France. In 2004 she was awarded with the statuette “Złoty Dobosz” for her outstanding artistic achievements as the flute soloist. She also made recordings for the Polish Radio and Polish Television (film sound tracks). Apart from her artistic activity she shows great passion for her work as a flute teacher. The development and achievements of the pupils give her a lot of joy and satisfaction that they can find playing the flute joyful and inspiring which makes them realize the beauty of music and opens them to the world of art.